For years, Duss had been a writer and commentator on American foreign policy, especially in the Middle East. But he remained largely on the outskirts of the public debate, a left-wing ideologue working as an activist through his keyboard. Over time, however, he gained more prominence and now finds himself as not only a Senate staffer, but as one who is the subject of a new lengthy profile in the Nation, written by David Klion. "Who Is Matt Duss, and Can He Take on Washington's ‘Blob?'" Klion asks in the title. "Bernie Sanders's foreign-policy adviser is part of a new generation of progressives fighting an entrenched status quo." Duss, born in 1972, is like Rhodes in key ways. First, Duss entered the national security arena late, and from another world entirely that even included creative writing. Unlike the stereotypical ambitious, well educated hustlers in pursuit of power in Washington, "Duss took a more meandering path, playing in bands and working odd jobs for years before finishing college in his early 30s," Klion writes. "He then spent the next decade influencing the public debate, mainly as a blogger, before finally emerging as a Senate staffer." To Duss, every exercise of American power in the Middle East is Islamophobic; every terrorist's actions can be empathetically understood if not justified. Western meddling is of course the root of all evil, and while human rights are important and dictators are bad, any action by the United States to protect the former or hurt the latter is worse, likely driven by a sinister agenda. Dialogue, after all, is the way to soften the hard men—and women, and whatever gender one chooses; sorry Matt—of the world who would do America harm, to show them that Washington understands their grievances and is sorry for whatever it has done, strategic interests be damned. When Duss was starting at CAP, Obama contrasted his opposition to the Iraq War with Clinton's initial support for it during a 2008 Democratic presidential primary debate. "I don't want to just end the war," Obama said. "I want to end the mind-set that got us into war in the first place." As Klion writes, for Duss, this line "was like hearing [Jimi Hendrix's] ‘Voodoo Child (Slight Return)' for the first time. It's like, ‘That is rock and roll.'" "Matt has always been willing to challenge underlying assumptions about the conduct of American foreign policy," Rhodes tells Klion. "He rightly seized on President Obama's statement … and he held us to that standard for eight years." Duss was, of course, disappointed with Obama's foreign policy, which did not sufficiently embolden America's adversaries or diminish American power in the world to his liking. In his piece, Klion recounts a seemingly minor story from Duss's youth, but one that produced a telling quote: "It was through playing in bands that he found his peer group, which included an Iraqi-American singer who helped personalize the first Gulf War for him. ‘I just was uncomfortable with America sending troops around the world,' Duss says." Progressive foreign policy is at its core a paradox. It seeks to promote a more peaceful, interdependent, and egalitarian world in which human rights are protected and the developing world can flourish along with a prosperous United States. Yet the thing most capable of making all of that happen—American power in all of its forms, military and otherwise—is what progressives fear and revile the most. 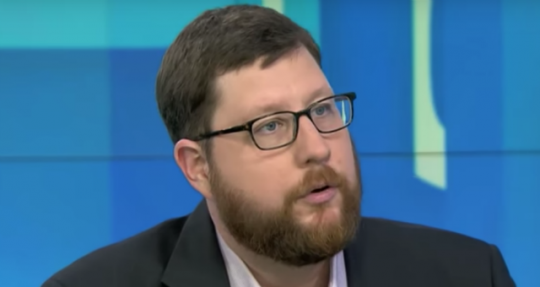 Matt Duss is tomorrow's thought leader for foreign policy on the left. That is a frightening prospect, especially as 2020 Democratic presidential candidates are falling over each other to sprint further to the left, even on matters of foreign policy. Who knows? Maybe Matt Duss will be the Ben Rhodes of the next Democratic White House, even if Bernie Sanders is not there. This entry was posted in National Security and tagged Ben Rhodes, Bernie Sanders, Foreign Policy, Progressive Movement. Bookmark the permalink.